When it comes to Coldstore Hire, we have rewritten the rule books yet again. We use either a unique Flat-Pack System for our walk-in Coldstores when inside or outside, or ready made portables, ex truck bodies, containers or towing trailers; enabling installation almost anywhere! Our flat-pack walk-in coldstores are built on site usually within one hour and simply plug into a 13 amp socket. The coldstores are available in various sizes and have the option of shelving or access for beer pipes at no extra cost. The Polyurethane insulated panels are CFC free, PAT tested, and fire retardant to BS4735. The units have a weather-proof exterior with foodsafe interior and non-slip flooring. All panels are 80mm thick & simply camlock together forming the basic shell. The Flat-Pack System eliminates use of large transportation and cranes and so allows easy access to difficult sites. Delivery and erection costs are included in our price. Once built the coldstore is left on site for the duration required and then we then take it down and remove from site. All coldstores can be supplied as chillers or freezers, they are fully weatherproof, have internal lighting, and are fitted with a secure lockable doors with internal release. 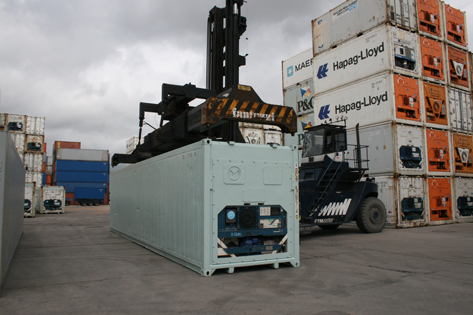 Ready made Portables and containers are delivered to site using a Truck with its own HIAB crane. Price quoted will include delivery to your postcode.